Headquartered in Atlanta, Newcomb Spring Corp offers nine state-of the-art spring manufacturing facilities in North America that specialize in prototypes, short runs and large production runs. We manufacture the highest quality parts at the best prices and are committed to providing the highest level of customer service in the industry. Compression Springs – coil springs with a material size range between .004-inches to 2.0 inches. Our facilities produce compression springs using round and rectangular wire, as well as square and special-section wire. Extension Springs – coil springs with a material size range between .005-inches to .468-inches. Newcomb facilities manufacture extension springs with over 8 spring end options using round wire as well as rectangular, square and special-section wire. Torsion Springs – coil springs with a material size range between .004-inches to 2.0 inches. Newcomb plants produce torsion springs and double torsion springs with multiple end options using round wire as well as rectangular, square and special-section wire. Stamped Forms & Flat Springs – parts are manufactured with a material size range of .003-inches to .125-inches, and up to 2.0-inches wide. Metal stampings and flat springs are often fabricated in conjunction with other parts and assembled to our customer’s specifications. Wire Forms & Strip Forms – manufactured components have a material size range of .004-inches to .468-inches for round wire, up to .062-inches thick and 2.0-inches wide for shaped wire and up to .187- inches thick for square wire. Battery Contact Springs – these contact springs are manufactured using round wire and strip material. While we can produce parts out of custom materials, we stock a nickel-plated carbon steel wire in sizes of .020-inches (5mm) and .024-inches (6mm) for quick turnaround on your prototype and production needs. 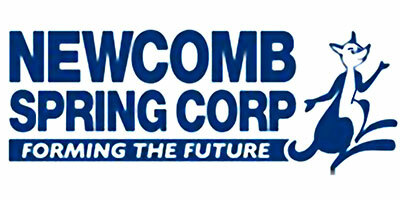 A family business for over a century, the Newcomb Spring Corporation is proud to have earned a reputation as one of the premier companies in the spring and wire form manufacturing industry. Each of our nine facilities is ISO-certified and equipped with state-of-the-art machining equipment. Newcomb Spring is a family of dedicated individuals who have a passion for quality, continuous improvement, and customer satisfaction. Our entire staff works to fulfill this mission, and it’s how we’ve earned a reputation as the “Kan-Do Company” – whatever your project needs, we can do it.